I have traced my family back to 990 A.D. and throughout the years our family served as soldiers much of the time. My ancestors fought in the Crusades in the 1200's, and served against the Scotts during the 1300's. In the 1500's my ancestors fought beside William the Conqueror and even served as a bodyguard for King Henry the 8th. In the 1600's we were sent to America for taking sides with Ireland. We continued to serve in the Revolutionary war and the war of northern aggression. Family members served in all the world wars including my Grandfather in World War Two and my father in Korea. I guess it should be no surprise that when I turned 18, I enlisted in the armed forces and headed for Viet Nam. I arrived in Southeast Asia as a19 year old kid and eventually ended up serving a total of 36 months in country. I will never forget landing and stepping off the plane to be hit with enormous heat and the smell of moisture. Although I had been trained by the Air Force, I knew that as a K-9 unit, I would serve with the Army and Marines while there. I was to pick up my German Shepherd once I arrived and together we were going to serve our country for a 12-month tour. I had volunteered for the job, knowing that there was a bounty on the dog's ears, and my life. I was told that in order to collect $1,000, which was a lot of money there, all they had to do was bring in the dog's ears and the patch off my beret. 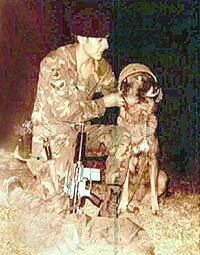 The life expectancy for a K-9 unit at that time was less than 6 months in combat. Having grown up in the hills of Tennessee, I had hunted all my life and knew the ways of nature. I had been taught to track and read signs at an early age, and was perfect for this mission. The only thing different now was that the hunted shot back. The first week was spent getting acclimated to the weather and for local training. We learned of the local inhabitants, including the deadliest snakes in the world.-- King cobras, Pit Vipers, Russell Vipers and even scorpions that could kill. The deadly two-step Viper was nicknamed because they estimated that if you were bit, you would survive about two steps before falling to the ground dead. This training was extremely important because my job would be done mostly at night, patrolling through swamps and jungles. I distinctly remember my first night alone. I was delivered to my post shortly after sunset in an area that I was supposed to patrol, miles away from other friendly forces. While the two ton truck that delivered me to my post drove off, my eyes slowly began to develop night vision and survey my surroundings. The road I stood on was 3-4 feet above the rest of the fields, which were rice paddies, completely flooded. The full moon reflected off the fields of water and soon I could see well enough to begin my patrol. I checked my equipment and made sure that I had a round in the chamber of my GAU-5A, a modified M-16 that I could shoot with one hand while holding onto my dog with the other. Later I learned how to use my dog's ears as a sight, knowing that he would alert on the enemy and look directly at them, even though I could not see them. As my dog and I ventured into the water that lay ahead, I could see the ripples of all the snakes swimming in front of us, moving away from the noise we made as we plodded through the muddy field. Not liking snakes all that well, I felt uneasy as I ventured into their domain. Later that night, I took a break and rested on the side of a fallen tree, wondering if my training in the martial arts would really help me in this strange land. Within a minute, we were joined by a cobra, which crawled up the tree as well. As I looked at him only a few feet away with his deadly venom, and me with my automatic rifle, and my dog who seemed to care less about the whole situation, I began to wonder how or if I would survive the next year. There was to be a lot of self-reflection over the next few months, as I spent 8-10 hours every day alone with my dog. My only contact with the rest of the world was a small hand held radio that I used to listen to what was going on, and to check in every few hours with command post. They were subtle, as in non-existence." I began to identify these characteristics in the enemy. They used Zapper teams, to sneak in and blow things up. These guys were professional warriors, like modern Ninja who could crawl on their bellies right past most sentries only few feet away. They found their way through the most complex trip flares and mine fields without as much as a sound. The only thing that could stop these guys were our K-9 teams. I knew if I was going to survive, that I would have to develop the ability to "see" and "hear." I would have to develop the ability to reach out and "touch" the enemy when I chose to. We were the eyes and ears of the American forces at night. Our mission was to locate the enemy, call it in, and then survive any way we could. We were to be invisible to the enemy, because we were alone and could not stand toe to toe in a firefight. Because of our distance, we would run out of ammo before help could arrive. We worried as much about friendly fire as we did the enemy because we were always in the middle. I cannot explain the helplessness of calling in a hostile threat, and then hugging the ground as your own forces use machine gun fire and mortars to pound the ground all around you. Even empty casings of illumination rounds will kill you if they hit you. In order to survive, we learned to enter the jungle at night and literally disappear until morning. At first, I relied on my dog entirely. His eyesight was 300 times better than mine, and he could hear things well before I could. His sense of smell was so good that he could detect the enemy up to a mile away, and simply by watching the way he alerted, I could tell you whether it was a sniper in a tree or in a tunnel. My mission was usually the first line of defense, detecting the enemy before they reached our forces. At other times, I was responsible for the safety of a patrol, making sure we didn't walk into an ambush. Sometimes I just hunted down the enemy so they would not be a threat to anyone on another day. Most of the time, I was alone, "me and my dog," miles away from the help of friendly forces. Hours alone, listening and watching, was the ultimate dojo for training in awareness for me. I soon began to see a development or heightening of my own awareness and senses. At first the characteristics that developed were easy to explain. I learned that when someone was approaching, the insects and other animals changed their patterns and became intensely aware of those sounds and movements. I began to watch the jungle and it began to speak volumes, in a language that I had not even recognized when I first arrived. At first the sign of snakes swimming in the rice paddies was fearful, but later they became friends, telling me that something was moving closer to me, within a hundred yards or so. I began to zoom in on a leaf that was out of place which showed that someone had been there and maybe had planted a booby trap. Trip wires, almost undetectable with the naked eye, began to jump out and I could see them 20-30 feet away. I even developed my combat sense of smell. At first, it was just the new guys with their cologne, but later I began to smell the locals when I was down wind, their scent unique due to their diet. Having these new heightened senses, I truly began to see what others did not see, and heard things that others only wished they could hear. I learned not to breathe for a period of time, so that I could detect others through their own breathing. At times, I felt I could hear the heartbeat of the enemy, who were only feet away. I learned that by remaining perfectly still, people could walk by me only inches away and not have a clue. To stay motionless as an enemy patrol goes by is a heart pounding experience to say the least. It is at times like that when you experience truly being alive. The final stage, however, could not be explained through mere heightened senses. I began to feel what to do, which way to go, when to stop and when to move. It was like I had an angel on my shoulder, directing and guiding me. I found myself living in the zone, totally aware but on autopilot, simply reacting to stimuli. At this point, reflexes are lighting fast and there is never hesitation in action. The split second you engage in combat, you strike out against your enemy, knowing that if you don't, he will. Totally immersed in the "now" was the only way to survive. The past was gone and there may be no tomorrow, therefore you had to totally live in the present, using every possible method. This heightened sense of awareness is with you 24 hours of everyday, no matter if you are awake or asleep. We had our senpai (a Japanese term meaning senior, as in training in a martial arts school), those that had been in country for several months and had survived. Many of the senior troops would take a rookie on and try to teach them basic skills to help them survive their first few months. Others took the attitude of letting them figure it out themselves, because they knew that a new guy could get you killed because they didn't have a clue of what was going on. I ended up serving 3 tours, or 36 months, in the jungle because I felt I was saving lives. Not for God and country, but because I saw the look in these 18 and 19 year old boys' eyes when they first realized that death was a reality, and they truly wanted someone to teach them how to survive. Most of the soldiers I served with that developed their awareness to high levels took months before they could get along again here at home because they found that they could not communicate about this experience -- the heightened awareness, the response and how that change impacts a person at every level of existence. Unless you have been there, it is hard to explain, so most just don't talk about it, except with others who had been there. Those who were martial artists, came back with a sense of reality that you can still see if you know what you are looking for. They still have the ability to flip that switch, and then there is nobody home, only a warrior waiting to react. In traditional Japanese martial arts they call total awareness zanshin. Zanshin is a difficult concept to understand. Some karate-ka considers zanshin to be only a physical posture and not expression of attitude. Zanshin is a heightened state of awareness, which allows the mind to work without attachment, thus denying the existence of any weakness. In combat, where split second reactions mean life or death, there can only be uninterrupted dominance, both mentally and physically, over your enemy. This dominance continues well past the point where many feel the battle is over, and perpetuates every fiber of one's life. The element of zanshin that allows a warrior to possess an ever-remaining alertness, in my opinion, can only be developed and experienced in combat, or at least in life and death training. Over the years, this awareness has deteriorated in me, or at least has become manifested in different ways. I do enjoy going out in the woods and seeing signs that others do not see. I also enjoy watching others and their non-verbal communication, and take pride in the fact that most of the time I am able to see outcomes minutes before they happen. I am also entertained when I attend referee clinics and hear them explain why there was no point awarded because there was no zanshin present. "One must have the ever remaining mind and never turn his back after a technique is thrown," is a common statement at a referee clinic. I can't help but thinking to myself, "if they only knew." Terry Bryan is a disabled Viet Nam veteran, as he was wounded during his last tour in a rocket attack. He currently holds an 8th degree black belt in Kojosho Kempo and a 7th Dan grading through the World Karate Federation. Over the years he has earned black belt rankings in other styles as well, including Shaolin Chuan Fa, Shotokan and Shorin Ryu. He is currently the executive director for the American Shorin Kempo Karate Association, a non-profit organization teaching martial arts and self defense in the Colorado Springs area. Previously he served as the General Secretary for the USA-NKF (National Karate Federation), the official governing body for the sport of karate with the US Olympic Committee.